Rebecca Sheff was an IILJ Scholar from 2012-2015. 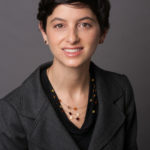 She has experience working as a Research Assistant for Professor Benedict Kingsbury and Professor José Alvarez at NYU Law, as an Extern in the Office of the Legal Adviser for the U.S. Department of State, as a Ford Foundation Law School Public Interest Fellow in the Refugee Representation Program at Human Rights First, as a Student Advocate for the Global Justice Clinic at NYU Law, as a Legal Intern in the Law and Sexuality Program at Lawyers Collective, and as a Legal Intern in the Social Justice Institute at the Center for Constitutional Rights. After receiving her J.D. from NYU Law in 2015, Rebecca went on to work as a Researcher and Advocate at Human Rights First, where she advocated for U.S. government engagement on behalf of human rights defenders in the Middle East, North Africa, and Horn of Africa subjected to retaliatory threats or violence. She is currently a Law Clerk at the D.C. Court of Appeals.